A group of researchers from 16 different countries teamed up for a study about obesity and cancer risk, and discovered that overweight individuals can reduce their risk of developing cancer by taking two aspirins a day. Their findings have been published in the Journal of Clinical Oncology. For the study, researchers worked with 937 Lynch syndrome patients. Lynch syndrome is a genetic condition known for increasing cancer risk, particularly in the colon and womb. Participants were randomly assigned either a placebo or a daily 600-milligram (mg) dose of aspirin (two pills). The researchers followed up with the participants after 10 years and found that obese patients had double the risk of getting cancer without aspirin. The follow-up showed that overweight participants who were taking the placebo were 2.75 times more likely to end up with colon cancer than patients who maintained a normal weight. However, for the overweight patients who were on the two-aspirins-a-day regimen, the cancer risk wasn’t any higher than normal. The authors of the study suggest that it may have something to do with the way aspirin affects the cells that are susceptible to becoming cancerous, by encouraging these genetically malfunctioning cells to die off. Another possible reason may be that aspirin has the ability to counteract the increased inflammatory response that’s typically seen in obese individuals—a higher inflammatory response has been linked to a higher cancer risk, even in individuals who don’t have Lynch disease. The next step for this team of researchers is to conduct a bigger trial, this time with 3,000 participants worldwide in order to test the impact of varying doses of aspirin—the hope is that lower doses will offer just as much protection. Despite their promising findings, researchers advise that patients consult with their healthcare providers before taking aspirin. Movahedi, M., et al., “Obesity, Aspirin, and Risk of Colorectal Cancer in Carriers of Hereditary Colorectal Cancer: A Prospective Investigation in the CAPP2 Study,” Journal of Clinical Oncology 2015; doi: 10.1200/JCO.2014.58.9952, http://jco.ascopubs.org/content/early/2015/08/11/JCO.2014.58.9952.abstract. 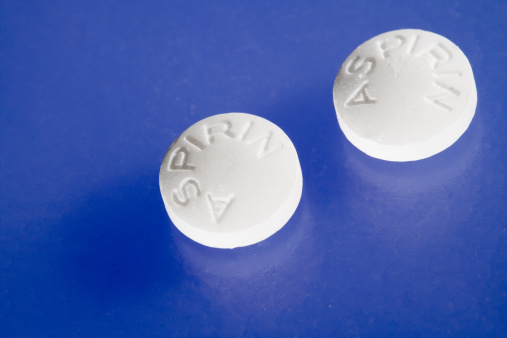 McIntosh, J., “Aspirin could reduce cancer risk of overweight people,” Medical News Today web site, August 18, 2015; http://www.medicalnewstoday.com/articles/298222.php.